Of course, once you've checked in you can come and go at any time. Earlier arrivals can often be arranged with prior notice. 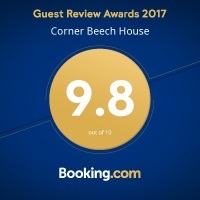 You are welcome to get in touch to check availability, arrival times or if you have any questions about accommodation at Corner Beech House Bed & Breakfast B&B in Grange over Sands. We can often arrange earlier arrivals if we are given plenty of notice. Please contact Corner Beech House B&B if you would like to check in to your accommodation earlier than 3:00 pm and we will do our best to help out. Cancellations made within 14 days of arrival will incur a first-night charge on all rooms associated with the booking. No shows or early departures will incur a charge of 100% of the booking. As with all accommodation bookings, it is advisable to take out your own travel insurance in case of unforeseen circumstances. Corner Beech House and its grounds are entirely non-smoking. Smoking inside the building, or within the grounds, will result in immediate cancellation of your booking without refund and a £150.00 surcharge. Check-in is between 3.00pm and 9.00pm. Whenever we can, we are happy to arrange for an earlier arrival if you notify us in advance. There is no flexibility for late arrivals: we do not check-in guests after 9.00pm, so any arrivals after that time are a no-show. Please ensure you have planned your journey times accordingly. Check-out time is by 10.00am on the day of departure. Sorry, we do not accommodate groups at Corner Beech House B&B without prior consent from the owners. Sorry, we do not allow children to stay at Corner Beech House B&B. Sorry, we do not allow pets to stay at Corner Beech House B&B.